Manchester United v West Bromwich Albion Saturday 8th March 1958 Munich Season"
The match ended in a 0 - 4 win for West Bromwich Albion, in front of 63,479 spectators. 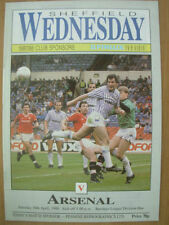 Manchester United v West Bromwich Albion. Liverpool v West Bromwich Albion, (Div 1), 19.10.1963. 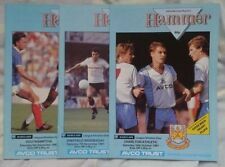 The programme has a horizontal crease and the half time scores filled in otherwise good condition. (See photos). 60 YEARS OLD. GOOD CONDITION - NO PEN MARKS - NO WRITING. Leicester City v West Bromwich Albion, (Div 1), 15.9.1962. The programme has team changes and some half time scores filled in (See photos). Arsenal v West Bromwich Albion, (Div 1), 30.9.1950. Score wrote within otherwise a crease free programme in very good condition. (See photos). Note Players and score on photo. Manchester City vWest Bromwich Albion 25-3-1967. Derby County v West Bromwich Albion, (Div 1), 8.11.1952. 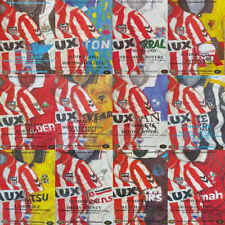 The programme has been creased and has some handling marks to the outer cover. There is also some staple rust evident. (See photos). 58 YEARS OLD ! GOOD CONDITION FOR AGE - SOF - SCORE ON TEAM LINE-UP PAGE - RS. 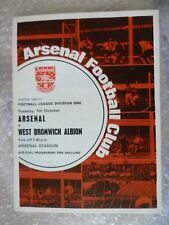 Arsenal v West Bromwich Albion, (Div 1), 12.12.1953. The back page has a one inch tear to the top edge otherwise a crease free copy in good condition. No writing within. (See photos). League match. 9 Sept 1961 - very good condition, number on front cover, fold, no writing. Wolverhampton Wanderers v West Bromwich Albion (Div 1),2.12.1950. The programme has a cellotaped spine. It has been folded and there are team changes and writing within. (See photos). Signed in clear black pen by Albion's Johnnie Nicholls and Ray Barlow and signed in clear blue pen by Albion's Jim Dudley. 61 YEARS OLD ! GOOD CONDITION - NO PEN MARKS - NO WRITING. First Division fixture played on 16th January 1965 at Molineux, it is in Very Good Condition. Good Luck ! 1966 League Division 1- WEST HAM UNITED v WEST BROMWICH ALBION, 3rd Dec.